In 2011, in Manhattan, Nour's father dies, filling the 12-year-old Syrian American girl with grief and upending her world. In the mid-12th century, in Ceuta, on the North African coast, 16-year-old Rawiya leaves home with her beloved horse, Bauza, to see the world. 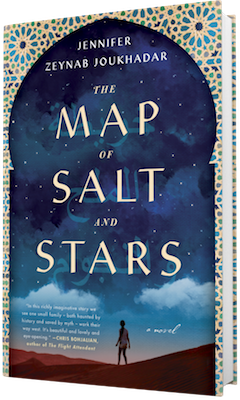 In The Map of Salt and Stars, Jennifer Zeynab Joukhadar has woven these two lives together in remarkable journeys touched by fable and fraught with danger. Nour's father, Baba, was an architect and a storyteller--that's how he untangled "the world's knots." Nour loved his stories, particularly the one about a mapmaker's apprentice; when his voice would tire, she'd finish for him. But after his burial, her voice "went into the earth with Baba, deep in the white bone of the earth." Her mother lost her words, too--"instead of talking, her tears watered everything in the apartment. That winter I found salt everywhere...." When spring came, those salt tears led her mapmaker mother, with Nour and her older sisters, Huda and Zahra, back to Syria, where everyone except Nour was born. Nour laments, "Now, thirty thousand feet above him, I am trying to untangle the knot he left in me.... But my words are wild country, and I don't have a map." Three months later, living in Homs, Nour is at a disadvantage because she speaks little Arabic. She also has synesthesia, which literally colors her world, but also sets her apart. She often goes out to the fig tree in their garden to tell her favorite story to the fig's roots, imagining the vibrations of her voice traveling to Baba as she recounts the tale of Rawiya and al-Idrisi--"The one Baba told me every night. The one where they mapped the world." There has been unrest in the city; one night at dinner with Abu Sayeed, Baba's adopted brother, helicopter blades "pop black and purple" over their heads. A shrieking sound follows and the ceiling collapses. Dazed and bloody, they all make their way outside to rubble and chaos. Rawiya's story begins with her desire to leave her village, to seek her fortune and save her family from poverty. One morning, by the fig tree next to the house, she saddles Bauza, takes the sling her father had made for her, and tells her mother she is going to the Fes market. Ten days later, disguised as a boy named Rami, she arrives in Fes, where she is dazzled by the rose- and saffron-colored houses, green minarets and the bite of pomegranates, the "sugar-song of dates." She is seeking the legendary mapmaker, Abu Abd Allah Muhammad al-Idrisi, with plans to apprentice herself to him. Unrecognized by her, he approaches "Rami" and agrees to tell her where to find him if she can answer three riddles. She does, he reveals himself, and takes her to Sicily to the palace of King Roger II of Palermo, his patron. There the duo, along with a new apprentice, Bakr, are charged with creating a map of the entire world. The expedition sets off for Asia Minor, and from the Anatolian coast, they enter the Levant and the Syrian province of the Seljuq Empire. Here, the tale of Rawiya and al-Idrisi begins to alternate with Nour's life as they begin parallel journeys that will eventually take them to Ceuta. Nour's family leaves Homs after the shelling. Their papers and belongings fit into one burlap bag; Huda is badly injured. They drive to Jordan with Abu Sayeed, but find no succor, only a brief rest. They leave for Egypt, then Libya. They endure a sinking ferry and separation; for Nour and Zahra, a terrifying trip across Libya hidden in a refrigerated truck. The trek is not safe for Rawiya and al-Idrisi, either. Rawiya saves the caravan from a great white roc--the legendary bird of prey--with her prowess with the sling; later, they battle enormous snakes with mirrored scales. Human obstacles appear, like the Almohad fighters looking to capture a certain mapmaker. Nour is "a small blue stone asleep in the earth, waiting for God to polish the salt from my skin." Although she cries, "I'm not Rawiya. This isn't an adventure. A yellow wail bubbles out of me," she is brave when needed, resilient, resourceful. Other elements besides courage link the two girls: fig trees, perils, refugees, constellations, even a mythical stone--beet purple in shadow, emerald in sunlight. Signs are dropped like markers: Nour thinks of her father in a hole, Rawiya says death leaves holes. Jennifer Zeynab Joukhadar is a Syrian American author. Originally from New York City, Joukhadar was born to a Muslim father and a Christian mother. She is a member of the Radius of Arab American Writers (RAWI) and of American Mensa. Her short stories have appeared or are forthcoming in the Kenyon Review, the Saturday Evening Post, PANK magazine, Mizna and elsewhere. 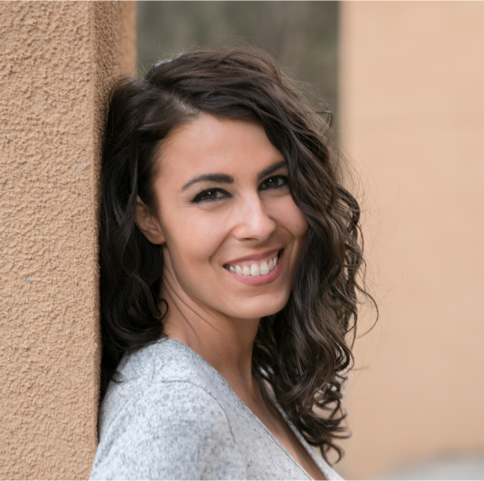 Her work has been nominated for a Pushcart Prize and the Best of the Net. The Map of Salt and Stars (Touchstone, May 2018) is her first novel. You are currently in Morocco for a writing residency. Are you working on a new novel? Is your cat with you? I'm using my time here in Morocco--which has been an immeasurable gift in so many ways--to work on my second novel. I'm excited about the project, though it's still in its early phases. I am also excited to read from The Map of Salt and Stars at the upcoming Fez Gathering here in the city. 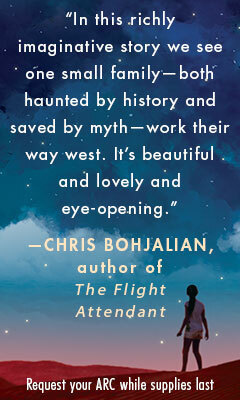 It's been amazing to live here in the old medina, which also appears in my debut novel. Fez is a city with an incredibly rich history, full of artists, full of creativity. I am so grateful for the people who have taken me into their homes and hearts here and made me feel welcome, and so glad to have this time to dedicate to my second novel and to this experience. My cat's a very chill and curious guy, and he enjoys adventure as much as I do. I adopted him eight years ago, and we've been through a lot together. We're best friends. I'd never leave him behind. Did you make up Rawiya's story? Yes and no. Rawiya herself is a fictional character. The specifics of her journey with al-Idrisi (a real cartographer) are fictionalized; no one knows exactly how much of the knowledge al-Idrisi gained for his map and book was gathered firsthand; much of it was obtained through talking to the merchants and other travelers who passed through Palermo while he was living and working in King Roger II's court. This fictionalized account is also permeated by fable and magic. But I tried to ground the journey in fact, for example in the conflicts between various groups taking place at the time--such as the Second Crusade--and the territories controlled by different Amazigh dynasties across North Africa. Is using two parallel stories a typical Arab storytelling technique? Telling two parallel stories was both very difficult and very addicting, and it's something I'm doing again (though in a slightly different way) in my second novel. I did draw many maps, and I did have to keep track of the names of places in the 12th and 21st centuries, and I drank a lot of chai! Weaving two or more stories together is a traditional Arab storytelling technique, one that is done extremely well in Rabih Alameddine's The Hakawati, one of my favorite novels. I find that with multiple stories, each one can illuminate aspects of the others without being too heavy handed, so the reader comes away with a layered and intuitive understanding of what the writer is trying to say. It is difficult to keep the various stories balanced, though, and to make the parallels between them visible enough to be noticed but not so obvious as to feel moralizing. Timing is everything. Nour finds salt everywhere after her father dies, beginning with her mother's tears. Salt is a theme throughout the book. What is the significance? For me, salt is a symbol not only of grief and of trauma, but of the struggle to make something beautiful of life in spite of those things. For example, salt is not only present in tears and in the sea, but also as a naturally occurring imperfection in precious stones. This does not mean suffering and trauma are good or necessary at all; I don't believe that. But if trauma does happen to us--particularly the violence inherent in war, displacement, and human cruelty--I wanted to ask: How can one make something beautiful of a life that has been irrevocably changed? What can we take with us after loss that can sustain us through, and beyond, that darkness? Zahra criticizes Nour because she doesn't speak Arabic, thus doesn't know what it means to be Syrian. Was that your experience growing up? Growing up, it was sometimes difficult to be an Arab who did not speak Arabic. Arab peoples have historically been defined and united, for better and sometimes for worse, by language. But there are plenty of Muslims who don't speak Arabic, or only know a little through the language of prayer. So I think there are other ways of looking at one's identity as an Arab and/or as a Muslim that don't hinge on speaking Arabic. Learning Arabic was something I needed to do to connect more deeply with my heritage, my relationships with my family, and also myself. I was born and live in diaspora, and this gives me a unique perspective, one that I've learned over the years to accept and value for what it is. For me, it can often mean having a sense of belonging to more than one place and also belonging nowhere, and this creates its own struggles and questions. I tried to let these questions breathe in the text without forcing answers. The Map of Salt and Stars brings attention to the plight of today's Syrians, and other refugees. I would very much like for this book to start a discussion about and increase empathy for Syrians, for refugees, and for displaced people in general. I cannot stand by and watch racism, Islamophobia and xenophobia in my own home country lead to things like the Muslim ban without doing what little I can to fight against that. I am connected to Syria. This is the land of my father's birth, the land of my family and my ancestors, the home of people I love. When Westerners present uninformed, fear-driven or racist views on Syrians and on Syrian refugees, they are, in a very real way, talking about people like my family. They could very easily be talking about me. I hope that this book makes them reconsider those views. With that said, I don't want readers to come away from this book thinking they know everything about Syrian refugees or that they know what it is to be one. I think this happens all too often with underrepresented voices in literature--a single story can be taken as the only one that is necessary for understanding, and that's never true. I want readers to understand that, if they haven't read anything by Syrians or refugees in their own words, this book is only a starting point. 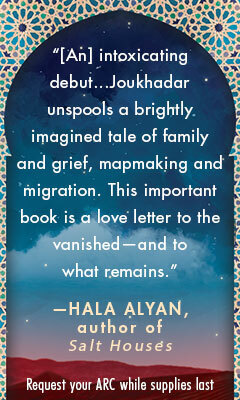 I also hope that this book will be a comfort to people of Syrian descent living in diaspora. I hope it will remind them, in some small way, of our rich heritage, our storytelling traditions, our imagination, our discoveries, our history. It's especially rare for Syrian Americans to see themselves represented in literature. I hope it will be a reminder that we, too, can be the protagonists of our own stories, that there is an alternative to the stories that so often get told in the West about Syrians these days, about Arabs, about Muslims.